Visual Numbers offers a “Category C” intelligence service to help companies better understand Part VIIIA drug tariff Category C medicines. The NHSBSA website contains Prescription Cost Analysis (dispensed medicines) and ePACT (prescribed medicines) open-data NHS information sets and we assist companies with analysing their market data. The effect of the introduction of Branded Category C medicines has been quite dramatic over recent years resulting in the NHS making significant savings. We illustrate the basics below using a real-life case study, but please contact us for information more specific to your company. 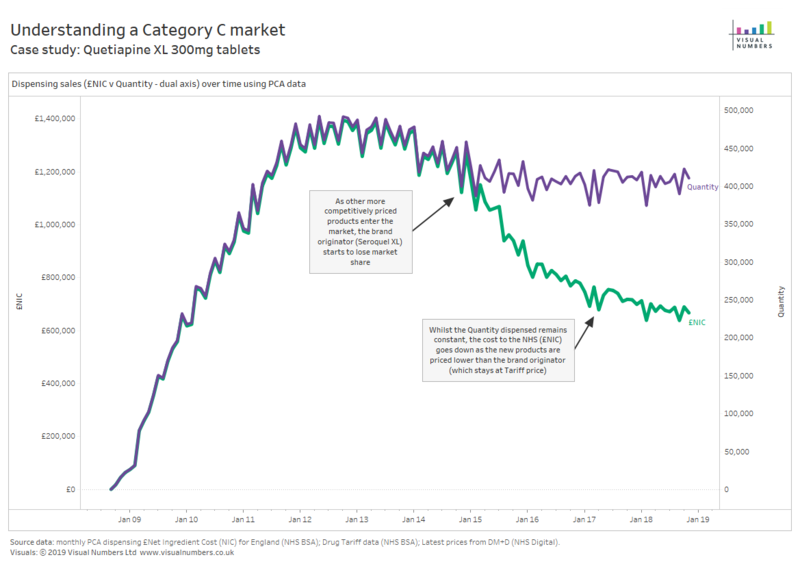 The visual shows an example of the Quetiapine XL 300mg modified-release tablets market, where Seroquel XL is the brand originator. In late 2014, Branded Category C generics such as Ebesque XL, Biquelle XL and Zaluron XL were launched into this market at significantly lower prices than the Seroquel XL price (i.e. the drug tariff price) and as Primary Care Organisations realised the potential savings available due to prescribing such medicines by brand name, the NHS saved significant costs whilst still treating similar numbers of patients.